We emphasise foods that will not only assist you in losing weight but also taste delicious and fill you up without overloading your body with starches. Try not to eat a big meal in the evening. Remember, you can always have a healthy desert or try an Energy Slim Weight Control Shake if you are still hungry later on. Poaching Liquid – 1ltr Milk, 100g Icing Sugar 50g butter. In this recipe, the turnips are the ravioli sheets. Combine poaching ingredients and simmer gently. Add sliced turnip until just soft then drain (don’t over-cook). Saute shallots for 30 seconds then add mushrooms & garlic adding thyme and chives at the end – 2 minutes. remove from heat. Place larger turnip slices on a board & centre mushroom filling onto these slices. Place another turnip slice on top of the filling and press gently but firmly to the under turnip. The stickiness from the sugar will stick the turnip slices together. Heat for a further 30 seconds in the microwave before serving. Serve with side salad and feta cheese. Boil the pasta, then cool under running water. Mix the mayo, mustard and honey in a large bowl and loosen with a little water to make a dressing the consistency of double cream. Add the pasta, chicken, onions, basil and tomatoes, season to taste, then gently mix together. 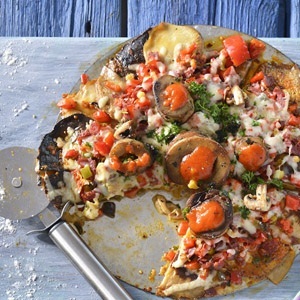 Any diet can make space for this mushroom pizza. Put the mushrooms on the baking sheet, season with salt and pepper to taste and drizzle with olive oil. Scatter the remaining ingredients on top of the mushrooms and bake for another 10minutes or until the cheese has just melted. Preheat the oven to 200°C and grease 2 baking trays or line with baking paper. Place 1 pastry sheet on a floured surface and cut in halve. Spoon an eighth of the mixture lengthways along centre of each piece. Fold 1 edge of pastry over and tuck in beside filling, then fold over other side to make a roll, pressing down lightly to seal. Repeat with remaining pastry and filling. Cut rolls into 3cm pieces and cut two small incisions into each roll to prevent splitting. Place on baking sheets, cover and chill for 30 minutes. Brush with beaten egg and sprinkle with sesame seeds. Bake for 20-30 minutes until the rolls are lightly browned and cooked through. Serve with sauce on the side. Preheat oven to 200°C. Line a large, shallow baking dish with non-stick baking paper. Place plum sauce, honey, ketjap manis, lime rind, ginger and allspice in a bowl; stir to combine. Place drumsticks in prepared dish, and spoon plum sauce mixture over drumsticks.Bake 30- 40 minutes, basting regularly, until sticky, golden and cooked through. Serve hot or cold. Serves 4. Whisk together the grapefruit zest and juice, oil, vinegar, sugar and dill to make a dressing. Mix half with the prawns and allow to marinate for 10 mins. Just before serving, gently toss the cucumber, shallots, frisée and rocket with the remaining dressing. 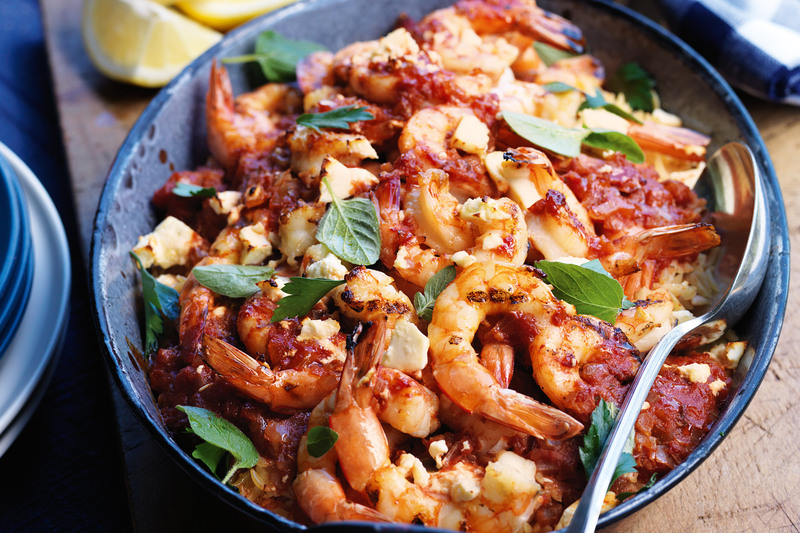 Add a pile to each of 6 starter plates, along with the prawns and grapefruit segments. Scatter over the pomegranate seeds and serve. Combine eggs, milk, cheese and sour cream in a bowl and mix gently. Cook added ingredients including spinach leaves. 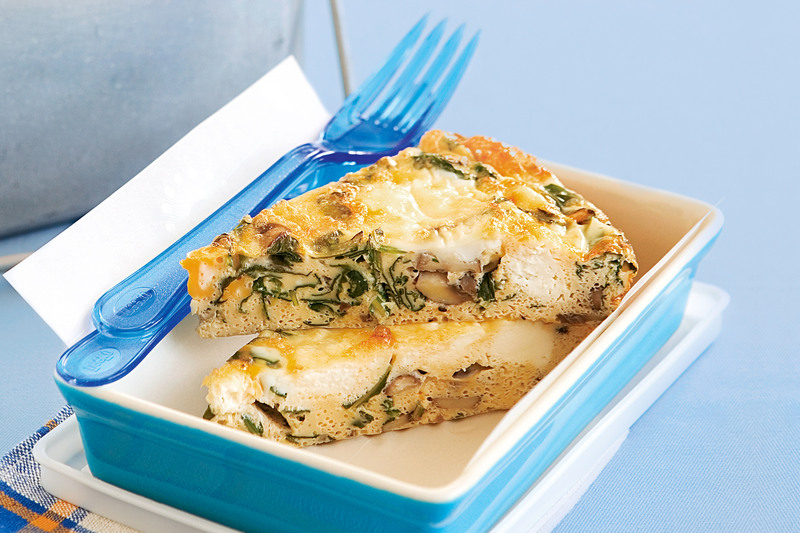 Pour egg mixture into a greased quiche dish and add cooked ingredients, Bake for 30-35 minutes in 180 degree moderate oven. Serves 4-6 people. 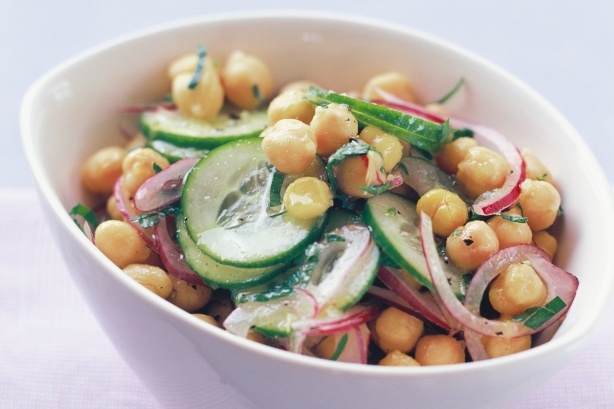 This low-fat and gluten-free meal is tasty and healthy too. Combine wine, lemon juice, garlic and oregano in a shallow glass or ceramic dish. Using a sharp knife, slice trimmed chicken breasts lengthways to form 2 thin, even-sized fillets. Add chicken and turn to coat. Meanwhile, spray a barbecue plate or chargrill with oil. Heat over high heat. Cook sweet potato for 5 minutes each side or until just tender. Add zucchini and chicken. Cook for 2 to 3 minutes each side or until chicken is cooked through and vegetables are browned and tender. Transfer sweet potato and zucchini to a large bowl. Add spinach leaves. Toss gently to combine. 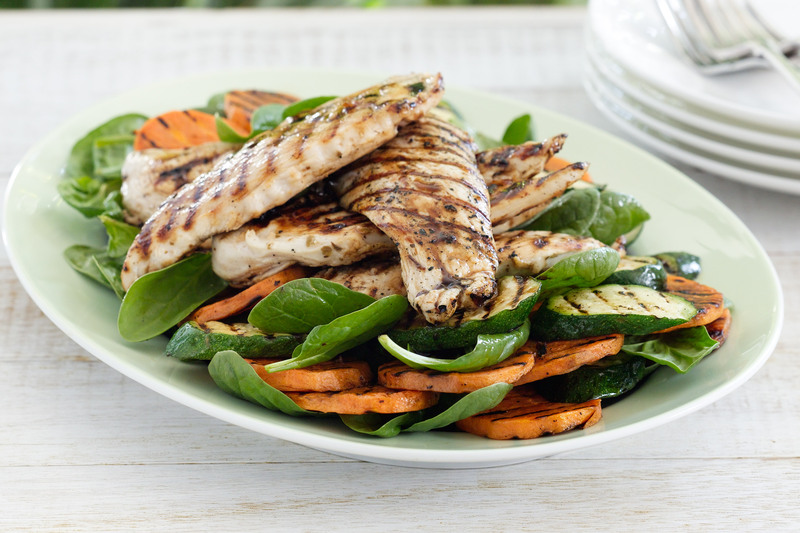 Serve chicken on salad, drizzled with vinegar. For a zestier dressing, combine the balsamic vinegar with 1 teaspoon of dijon or wholegrain mustard. 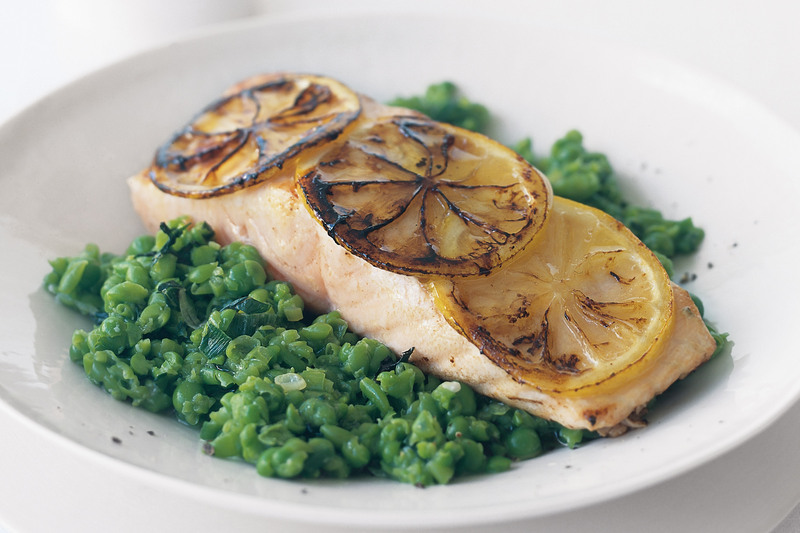 Lemon Salmon with Crushed (Minted) Peas. For minted crushed peas, heat oil in a saucepan over medium-low heat, add spring onions and cook for 1 minute. Increase heat to medium-high and add peas, stock, sugar and mint, and cook for 5 minutes. Drain, reserving 1/3 cup of the liquid, then add back to pea mixture. Roughly mash or pulse in a processor to roughly chop. Stir in cheese, then cover and set aside. Place lemon, slightly overlapping, on top of each fillet. Heat oil in a large non-stick frypan over high heat. Carefully add fillets, lemon-side down, and cook for 3 minutes or until lemon begins to caramelise. Carefully turn over and cook for a further 2-3 minutes. Serve on peas. Preheat oven to 200°C. Line baking tray with baking paper. Combine breadcrumbs, parsley, garlic salt and parmesan in a bowl. Place yoghurt in separate bowl. 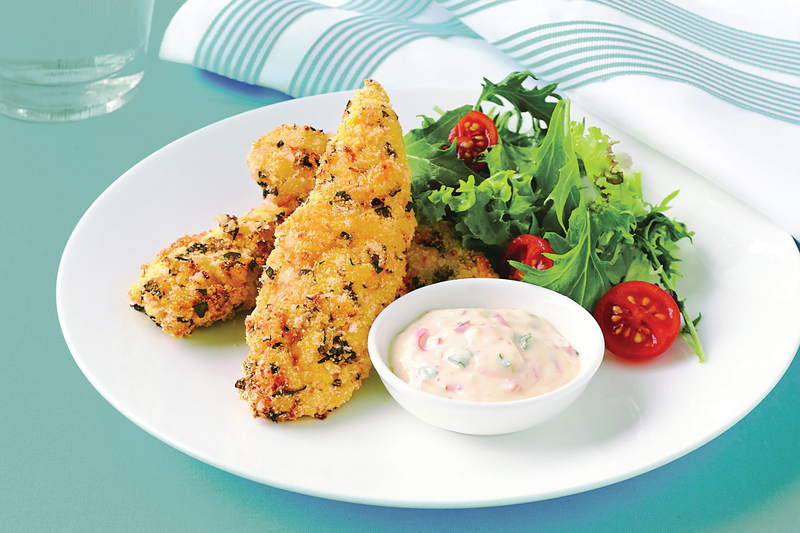 Dip chicken in yoghurt, shaking off excess. Toss in breadcrumb mixture. Place on trays. Spray chicken with oil. Bake for 15 minutes or until golden and cooked through. Make sweet chilli yoghurt Combine ingredients in a bowl. Serve chicken with sweet chilli yoghurt and salad. Serves 4. Variation: You could use chopped capers and dill leaves in the yoghurt dressing instead of sweet chilli sauce and coriander. Heat oil in wok over high heat until just smoking. Add the shallot, garlic and ginger. Stir-fry for 30 seconds. Add mince. Cook, stirring with a wooden spoon to break up any lumps, for 5 minutes or until the mince changes colour. Combine the hoisin sauce and water in a small bowl. Add to the wok and stir-fry for 2 minutes. Remove from heat. Add the bean sprouts and toss to combine. 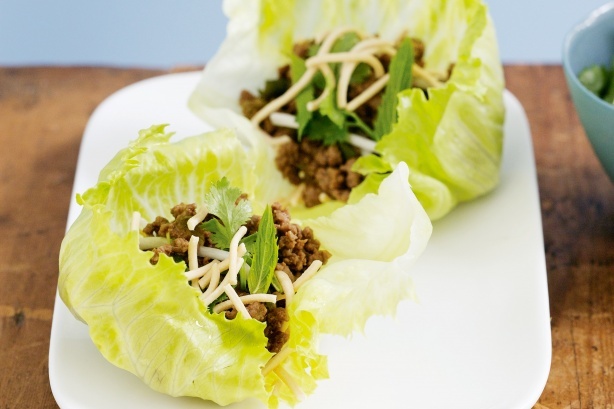 Divide the lettuce leaves among serving plates. Divide the lamb mixture, mint and coriander among the leaves. Place stock in a large deep frypan with wine & bay leaf. Bring to the boil, then simmer for 2 minutes. Add chicken to the stock and poach, uncovered over medium-low heat for 10 minutes or until cooked through. Transfer to a plate and cover loosely with foil to keep warm. Add carrots to stock and simmer for 5 minutes. Add beans and cook for a further minute. Divide vegetables among serving bowls and spoon over a little stock. 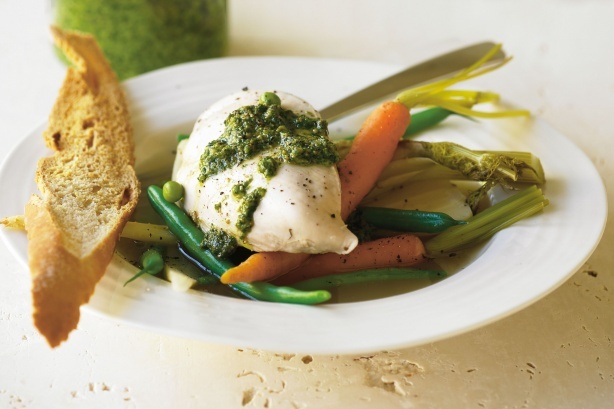 Top with chicken breasts and a dollop of pesto, and season with freshly ground black pepper. Preheat oven to 200°C/180°C fan-forced. Line a baking tray with baking paper. Place eggplant on prepared tray. Roast for 45 minutes or until eggplant is soft. Cool.Halve eggplant lengthways. Squeeze out excess liquid. Using a metal spoon, scoop out flesh onto a chopping board. Finely chop. Transfer to a bowl. Add breadcrumbs, flour, fetta, onion, basil and parsley. Season with pepper. Stir to combine. Shape mixture into 8 patties. Heat oil in a frying pan over medium heat. Cook patties, in batches, for 2 minutes each side or until golden and cooked through. Transfer to a plate lined with paper. 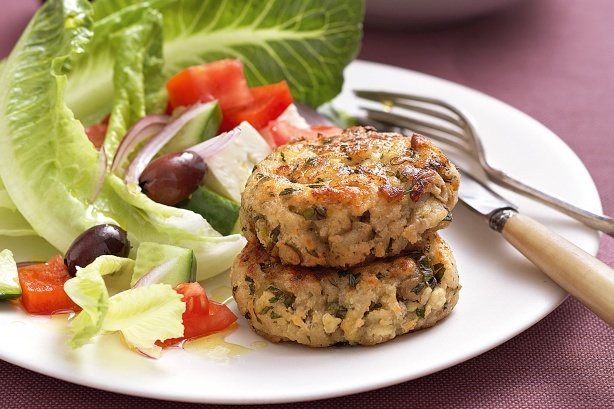 Serve patties with Greek salad. Combine all ingredients in a bowl. Form flattened patties with your hand. Stand in fridge for 30 minutes if possible. Spray pan with oil, BBQ or grill for 5-6 mins each side or until cooked. Note: do not add egg if using chicken or turkey mince. Drain on paper towel before serving. Serve on a plate with steamed vegetables or a fresh salad. 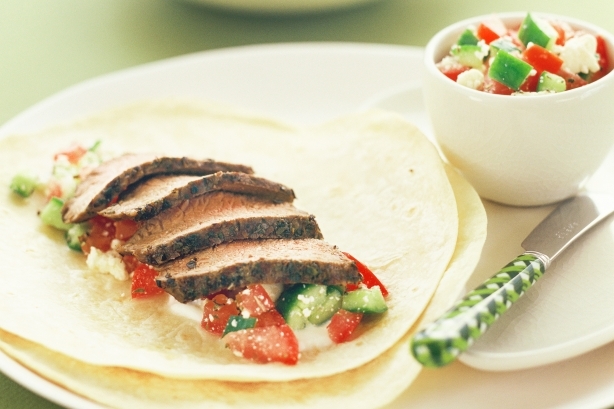 1 – Gyro – Slice patties into 3 strips, place onto Sorj (flat) bread with salad and Tatziki yogurt for a great Souvlaki. 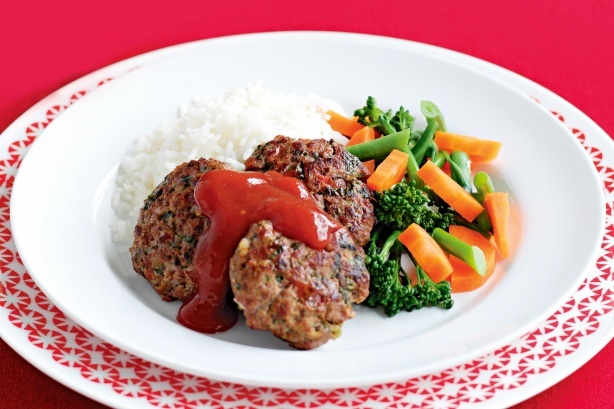 2 – Meal Balls – Form smaller round meat balls. Brown in a fry pan with onions, then add to tinned tomatoes. Place chicken in a saucepan and pour over enough water to just cover. Season with sea salt and freshly ground black pepper, then cover with a lid. Bring to the boil over high heat, then reduce the heat to medium and simmer for 10 minutes. Remove the lid and stand the chicken in the liquid for 10 minutes. Drain, thickly slice & set aside. Combine vinegar, tamari, sesame oil, spring onions and sesame seeds in a bowl and whisk to combine. 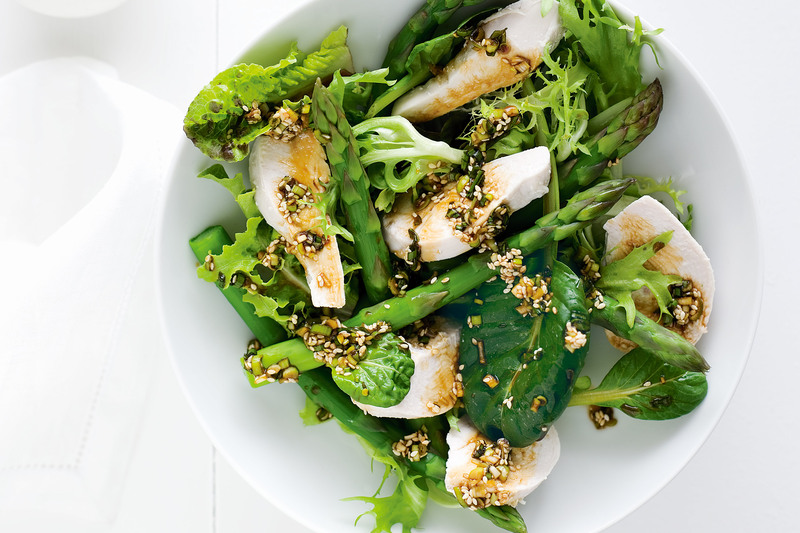 Divide the asparagus, salad leaves and chicken among serving plates and drizzle with the dressing. (optional) roasted vegetables – eggplant, pumkin, carrots etc. Spread the tzatziki sauce in an even layer down one edge of the flat bread. Add your salad and / or vegetables, then layer your meat (hot or cold) on top. Roll the bread, folding up the bottom halfway through, to complete the Souvlaki. Preheat the oven to 180°C. Pare / peel lemon rind with a peeler, being sure not to take any of the white pith. Squeeze lemon juice into a bowl. Add garlic, herbs and half the oil. Season, then set aside. Heat remaining oil in an ovenproof pan over medium-high heat. Fry lemon rind for 30 seconds. Season fish, then place skin-side down in the pan. Cook over medium heat for 3-4 minutes until skin is crisp and flesh turns white at the edges. Place pan in oven for 5 minutes until fish is just cooked through. Return pan to low heat, pour over herb mixture and warm through. 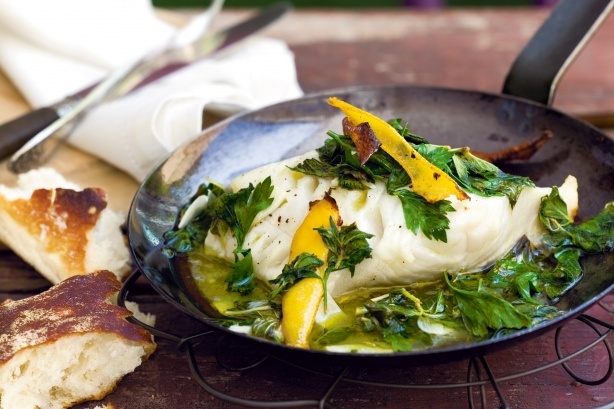 Serve fish with fresh salad and crusty sourdough. Preheat the oven to 200°C. Line tray with baking paper placing 2 halved pastry sheets. Spread on pesto, leaving a 3-4 cm border. 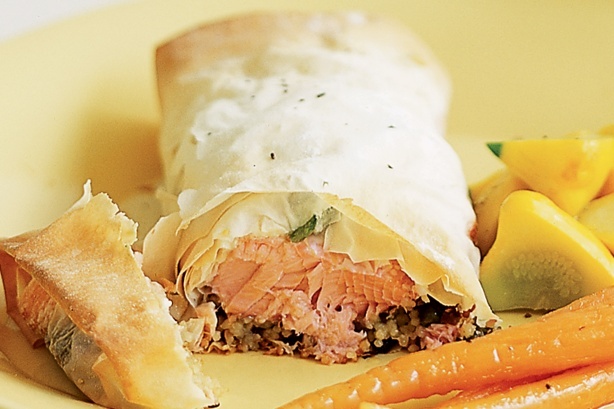 Place salmon & tomato, drizzle with lemon juice and brush the pastry border with some beaten egg. Cut 4-5 long slits in the centre of the remaining pastry pieces and over a salmon fillet, pulling slightly to separate strips, then press down the edges and trim, making each parcel into a neat rectangle. 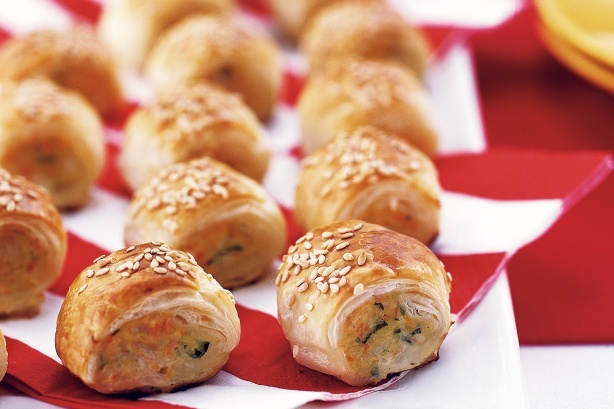 Brush the pastries all over with beaten egg and sprinkle with sesame seeds. Bake for 20-25 minutes until the fish is just cooked through and pastry is puffed and golden. Serve with lemon wedges and a green salad, if desired. Place chopped onion, garlic and chilli in a dish, then add beef and coat. Refrigerate for 30 minutes, if time permits. Heat pan or bbq, cook until cooked to your liking, rest for 5 minutes. Now make the dressing whisking all ingredients until combined. If required, thinly slice beef across the grain. 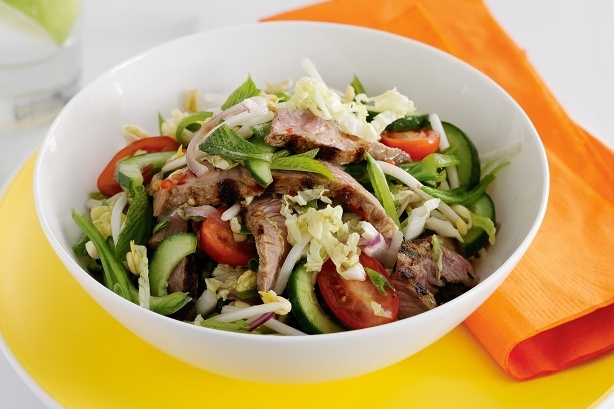 Place cabbage, snow peas, tomatoes, cucumber, beetroot, sliced onion and beef in a large bowl. Pour over dressing, toss and serve. Combine all ingredients in a large bowl and toss gently. Place on top of fresh spinach and lettuce leaves. Top with yogurt – optional. 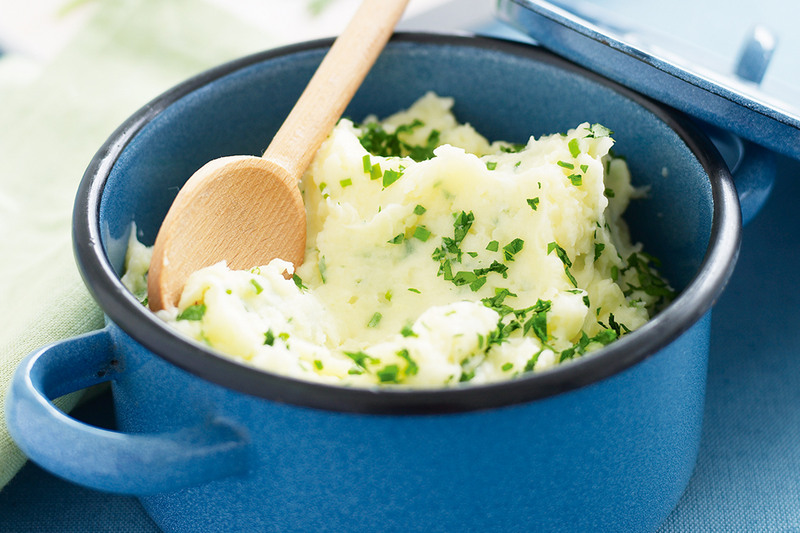 Cook potatoes, uncovered, in a large saucepan of boiling, salted water for 10 to 12 minutes or until soft. Drain. Return potatoes to pan. Add milk & eggs. The heat from potatoes will cook the eggs and give you a lovely golden smooth texture to your potatoes. Mash until smooth. Stir in parsley. parsley. Serve hot. Serves 4. Friday-night pizza goes low-fat with a lean lamb and creamy ricotta topping. Preheat oven to 200°C. Preheat grill on high. Spray a large baking tray with olive oil spray to lightly grease. Place the capsicum, skin-side up, on the prepared tray. Lightly spray with olive oil spray. Cook under grill for 5 minutes or until charred and blistered. Transfer the capsicum to a sealable plastic bag and set aside for 5 minutes (this helps lift the skin). Peel the skin from the capsicum and cut the flesh into thin strips. Meanwhile, spray a frying pan lightly with olive oil spray. Heat over high heat. Add the zucchini and cook, stirring, for 3-4 minutes or until the zucchini is tender. Transfer to a heatproof bowl. Season both sides of the lamb with salt and pepper. Add to the pan and cook for 2-3 minutes each side for medium or until browned. Transfer to a plate and cover with foil. Set aside for 3 minutes to rest. Thinly slice the lamb across the grain. Spread the bread with pesto. Sprinkle with the cheese. Top with the zucchini, capsicum, lamb and ricotta. Place pita breads on 2 baking trays. Bake in oven for 10 minutes or until the cheese melts and base is crisp. Sprinkle with basil leaves to serve. Serves 4. 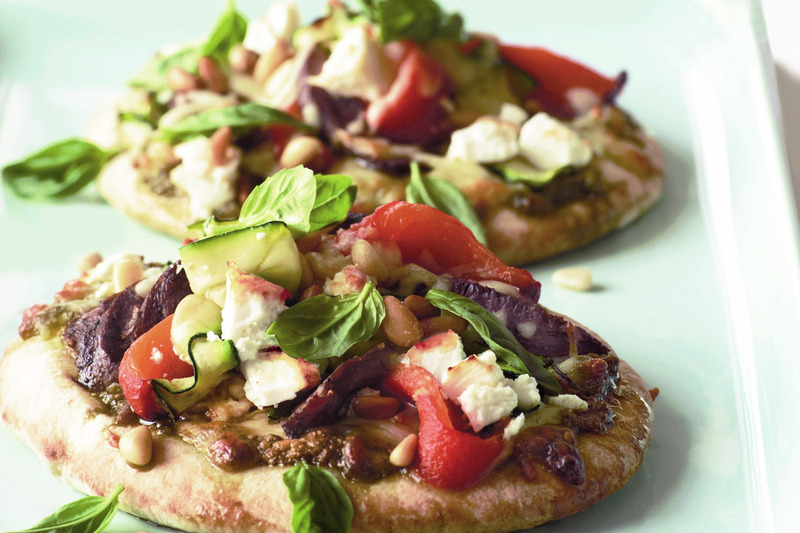 Mexican beef &amp; bean pizza: Omit the zucchini, ricotta, pine nuts and basil. Replace the lamb with 300g lean beef mince. Replace the basil pesto with 4 tbs sun-dried tomato pesto. Cut the capsicum into 5mm pieces. Heat 2 tsp oil in a large frying pan over medium-high heat. Add the mince and cook, stirring to break up any lumps, for 5 minutes or until mince changes colour. Add 1/2 x 35g sachet taco seasoning and cook, stirring, for 1 minute or until aromatic. Add the capsicum and 1 x 125g can kidney beans, rinsed, drained, to the pan. Cook, stirring, for 2-3 minutes or until heated through. In step 3, top the pita bread with the mince mixture and sprinkle over the cheese. Top with a dollop of mashed avocado to serve. Chicken &amp; sun-dried tomato Turkish toasts: Omit the ricotta, pine nuts and basil. Replace lamb with 300g single chicken breast fillets. Replace the pita bread with 2 Turkish bread rolls, split. Replace the basil pesto with 4 tbs sun-dried tomato pesto. In step 2, cook the chicken for 5 minutes each side or until cooked through. Top with 40g baby spinach leaves to serve. Roast pumpkin & chicken pizza with mango chutney: Omit the capsicum, zucchini, lamb, ricotta, pine nuts and basil. Replace the pesto with 4 tbs mango chutney. Preheat oven to 200&deg;C. Place 300g Kent pumpkin, peeled, deseeded, cut into 1cm pieces, on a baking tray. Spray with olive oil spray. Roast for 15 minutes or until tender. In step 3, top the pizzas with the pumpkin, 150g (11/2 cups) shredded Woolworths Country Style Roast Chicken and 1 red onion, halved, thinly sliced. Line a baking tray with non-stick baking paper. Place the pizzas on the lined tray and spray with olive oil spray. Bake for 10 minutes or until the onion is just tender. Serve. Heat a medium saucepan over medium heat. Spray with oil. Cook the onion and garlic, stirring occasionally, for 3 minutes or until soft. Add the wine and simmer for 2 minutes or until the liquid is reduced. Add the tomato pasta sauce, water and dried oregano. Reduce heat to low. Simmer for 25 minutes or until the sauce thickens. Taste and season with salt and pepper. Cook the risoni in a large saucepan of salted boiling water following packet directions. Drain. Stir in 1 1/2 tablespoons of the fresh oregano. Meanwhile, preheat non stick saucepan. Spray the prawns with oil and season with salt and pepper. Cook the prawns for 2 minutes each side or until cooked. Reheat the tomato pasta sauce mixture over low heat and stir in half the feta. Place the risoni in a serving dish. Pour over the passata mixture and top with the prawns. Sprinkle with the parsley, remaining feta and remaining fresh oregano. Serves 6.